Following a pollution incident in summer 2015, a Stoke-on-Trent company has donated £150k to help restore a river. The money from the enforcement undertaking will be put towards improving natural features in reaches of the upper River Trent. Stoke-on-Trent company, Fuerst Day Lawson Ltd, has donated £150,000 to The Trent Rivers Trust, following a pollution incident in the summer of 2015. Between July and September 2015, a polluting matter entered the balancing pools on Stanley Matthews Way and then entered the Newstead Brook. Discharge from Fuerst Day Lawson’s site on the Newstead Industrial Estate in Trentham, contributed to the impact on the watercourse. Food ingredients manufacturing company, Fuerst Day Lawson, offered an Enforcement Undertaking to the Environment Agency, which was accepted in September 2018. The donation to the Trust will be used to fund environmentally beneficial projects being carried out in the Stoke-on-Trent area. Additionally, the company has carried out extensive improvements to the site and paid a significant proportion of the Environment Agency’s cost associated with the incident in the amount of £119,143.39. Enforcement Undertakings are an effective enforcement tool enabling companies to address non-compliance with environmental regulations which provides support for suitable environmental projects. We’re delighted to have the opportunity to work with landowners to deliver a number of river restoration schemes along the upper reaches of the Trent. 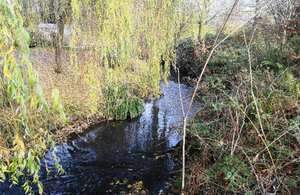 The works are funded through an enforcement undertaking after a historical pollution incident. Works are focussing on restoring the river at several sites to recreate a range of natural features within the channel and on the banks. The increase in features will enable the river to better breakdown pollution in the future as well as create improved habitats for fish and other wildlife. An Enforcement Undertaking is available to the EA as an alternative to prosecution or monetary penalty when taking enforcement action. It is a legally-binding voluntary agreement proposed by a company (or an individual) when the EA has reasonable cause to suspect that an environmental offence has occurred. Enforcement Undertakings for environmental offences were introduced under the Environmental Civil Sanctions (England) Order 2010.